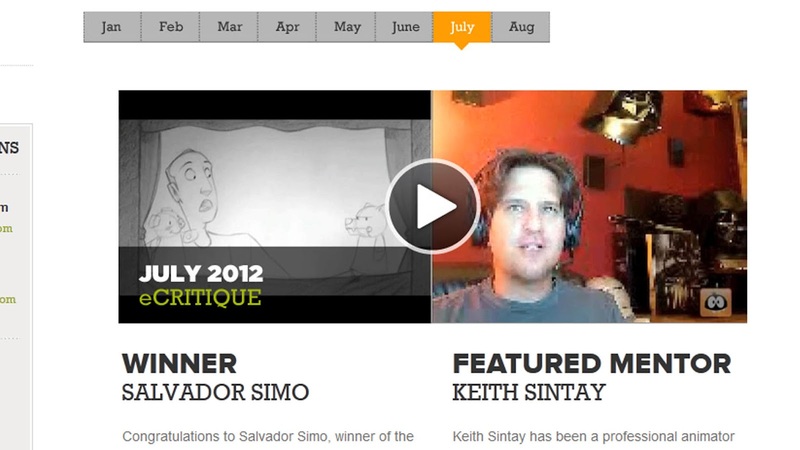 For July's monthly winner, Salvador Simo used beautiful craftsmanship to presents his puppet show. I must add, I received the interview last week, however, I felt the need to delve a little deeper. I am super glad I did. I hope you enjoy the tales from Salvador's 20 year career so far, and hold dear his words of inspiration. That to enter the magically world of animation, 'Anyone can get there, it is just a matter of hard work'. I want to thank Salvador for his time and wish both him and the community good luck for their future endeavors. Enjoy! What influenced you to become an animator? Well I had been always drawing since a kid, but I started off my University studies as a lawyer. Then, after a while, I got onto a introductory course on Saturdays morning doing 2d animation. I can’t remember why, and it was there where I was introduced to this new world. And that was it. I knew that was what I really wanted to do. Mainly what called to me was the honesty of this environment. Anyone can get there, it is just a matter of hard work. Your career as an animator has taken you around the world, including visits to Barcelona, London, Thailand. Care to share any fun memories of these travels? I’ll add Los Angeles and Paris. These are very important for me. 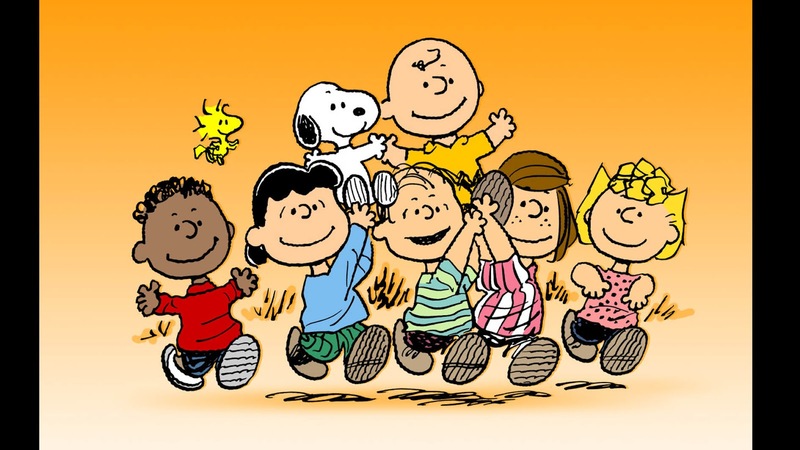 The first one is when I did work with Bill Melendez in The Peanuts Show. I had a great mentor and friend there, Larry Leichliter. When I went to Los Angeles in 1992 I went to take night classes in the American Animation Institute, and during the day I was in the studio of Bill Melendez - I´ll say more learning than working. Bill offered me a desk and the chance to help them and learn from them. It was amazing to meet him and hear him talking, feeling his passion for animation, for me that time was a lifechanging experience. It was in the studio that I meet Larry. He is a great animator and now Director, with a lot of patience. Basically he became my mentor and I did learn a lot from him, not only as an animator, but also as a person. I was amazed by his kindness and his talent. It was one of those things that you find only once in a while, that moment when you are young you say "I´ll like to be like him when I grow up". Working with the Peanuts, was a privilege. 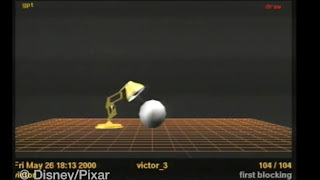 The animation style they achieved was more on the illusion of movement. It was stylized animation more than the full rendered animation of the Disney films, and I think that has been always there somehow. I consider myself very lucky and grateful for that time. When I went to Paris, I somehow got my dream to work in Disney. I had amazing time everywhere, but probably the bigger laughs were in Disney when about 20 people from different countries we were trying to learn French in the same class, and all of them from the studio, you can imagine ... we learned a lot. So in London and Paris I had the most fun, enjoying the beer on Fridays after work with the colleagues. Have you visited any of their fine art galleries? If so, what was your favourite piece of fine art and where was it on show? Yes, I visited as many art galleries as I could. The classics that are my favorite. 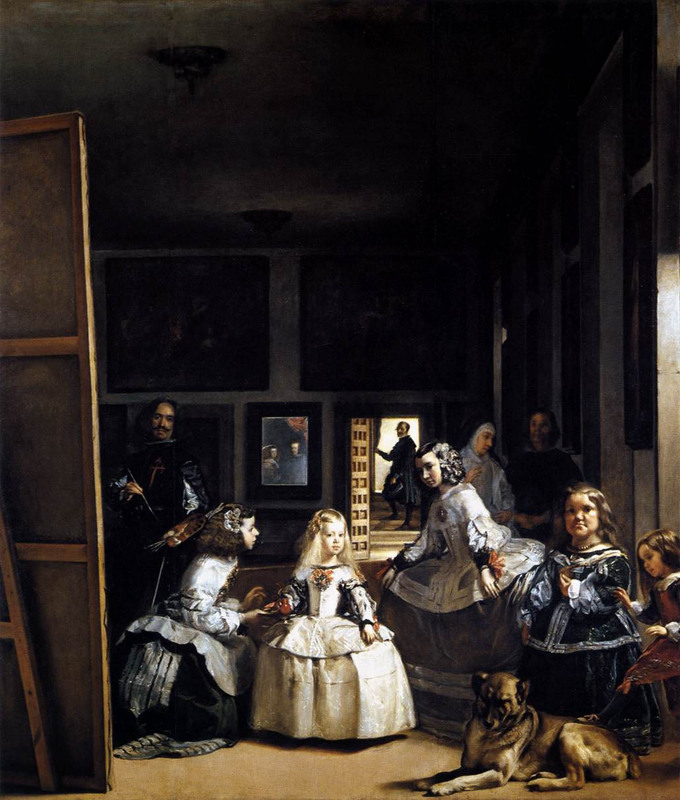 I have to mention Sorolla and the sculptures in Orsay...the Rodin Museum in Paris... Las Meninas by Velazquez in el Prado-Madrid. I was surprised by the art in Thailand. They have a quite new museum in the centre of Bangkok. It is not very big, however, it exhibits some really impressive young talent. After 20 years in the industry, where do you turn for new inspiration? Well here I’m not very original. I did start my career in 2d animation and there is where I always start. 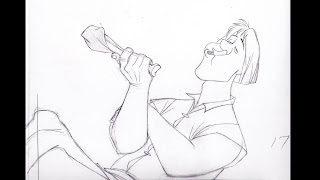 The 'simple' pencil tests of Glen Keane or Milt Kahl, they just blow your mind every time. I also like to see the work of many illustrators with amazing styles, available online, or some comic book of Loisel and some other artist. Please talk about your previous experience in traditional animation. I have spent half of my career in 2d animation. 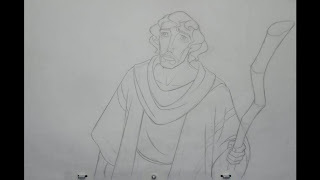 I started by painting cels and explored all the steps through to animation and layout. It is an art form that makes me very sad that it is becoming less and less. The people were quite amazing, they were artists that had a strong passion for it. Deep in my heart I will always be a 2d guy, so what can I say. Later I moved to 3d and I think is great. It is a new way to work with animation and has many advantages. It is a relatively new tool with the same principles, and some more technical stuff. But I still miss the feeling of the pencil and the paper. Have you had any personal experience bringing puppets to life with ventriloquism or stop motion? Actually not, but I always start my animations thinking that the characters are puppets, so you are forced to rely on the basic pantomime not in the face, then I developed from there. I think the magic of the puppets is on the simplicity and that is what captivate me most. Puppets seemed to influence your earlier work. Would I be correct in noting that the style of your short film 'Insight' was influenced by the stop motion work by Tim Burton? Well I understand that in 3d we move digital puppets and I have been influenced by many kinds of animation. It will be false to not say that Nightmare Before Christmas did not influenced me. It is an amazing piece of art and entertainment, that has influenced a lot of people. When I did Insight I was looking for simplicity. I had very, very low resources and I wanted to finish it so I had to find a way to tell the story as simply as possible. 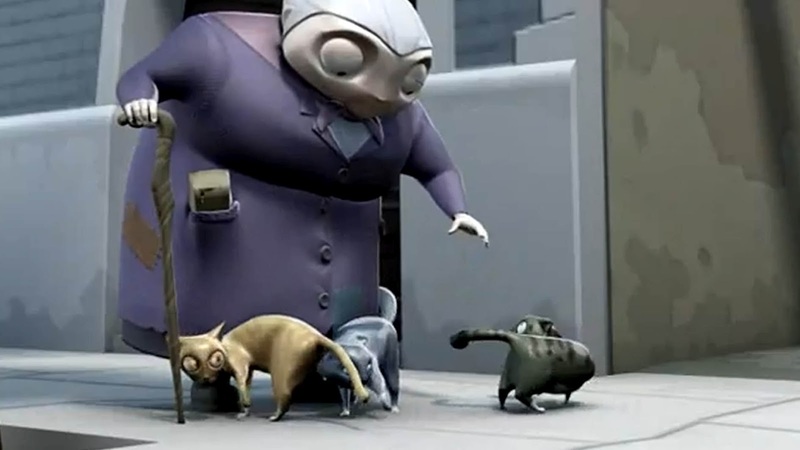 I think the influence of the stopmotion is on the simplicity and effective way to animate. It is an interesting reference to study. 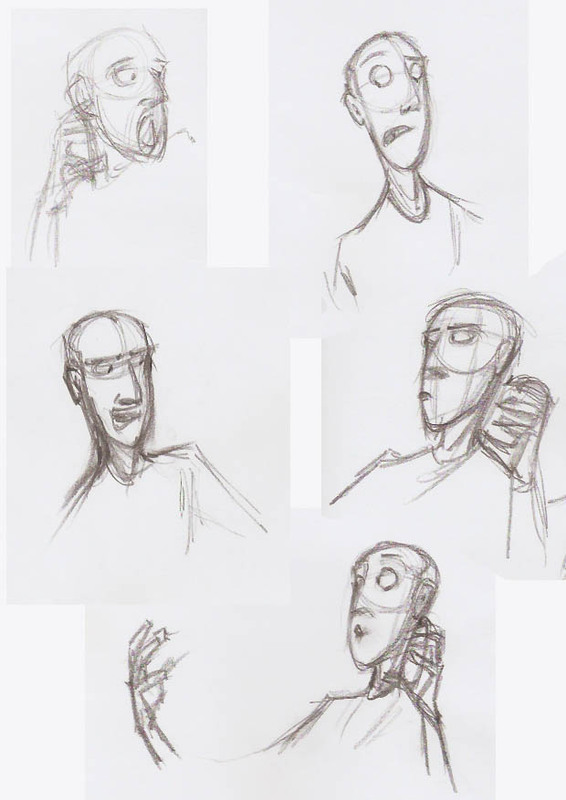 The characters of Insight were designed in this way, because it was a mute film the characters were not going to talk. This led me to enlarge the eyes to give more expression and space in the face. The shape of the characters all started with very simple shapes. the head of the grandma started as half circle and the body as a cylinder. I like to use simple shapes as much as possible. 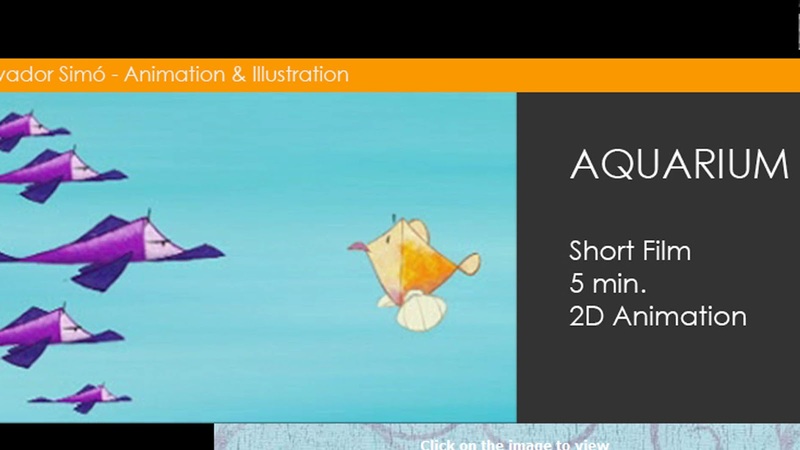 In my 2d shorfilm Aquarium, the fish were based on a square shape and the bad guys were triangles. On the subject of simplicity, I think when anyone starts a personal project we aim very high. This is good to do, but you also have to have your feet on the ground. If you aim too high the project will not be complete and that is very sad. Sometimes I have to put my producer´s hat on and be realistic. My director´s hat helps me to find a doable way to produce the project and be able to finish it. However, it is also important that we always put some of our life into the designs/animations. For Insight, I did reference someone very close to me, but then chose to push the graphic concept of the design and play with it. Focusing on your winning entry, I now must ask: Why did you choose puppets? Well, I think the challenge is not only on doing a technically good piece, but it has to be entertaining for the audience. When I first heard the dialogue, I didn’t want to fall into the first choice and I tried to look for something a little further. I took a risk, and I thought that to have the two puppets, a kind of three little pig tease, would be more fun. Talk a bit about your animation process for your entry. 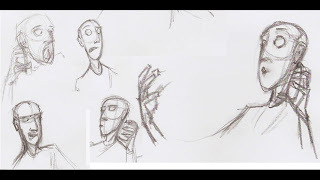 Once I had the concept I first shoot myself to take some acting references, and sketched some ideas to plan the animation. I knew I had to make a choice here go for the puppets as a main characters or the puppeteer, and I choose the second one, maybe a wrong choice but actually I thought to do this exercise to have fun rather that wining the competition, I could play more with the expressions and acting with him, so worth the risk. I hope this explains my staging choices. After that I rough the key poses and did a rough pass on the breakdowns, and later the cleanup process. The puppeteer's lip sync is delightfully expressive. Please talk a bit about your approach to facial animation. Thanks a lot, I enjoy a lot the lip sync in animation, is a part that defines a lot of character in the acting, if you check some english actors the way they have to pronounce the words and the accents give a big stroke on the personality of the character, is fascinating to see. On my exercise I went for clear shapes and the feeling of the motion, than hitting the exact labials, I tried to hit few key expressions. It was very thankful on the comment on the e-critique about the jaw, is true that a bit more work on it would had improved a lot the exercise. Please may you discuss your reasons for staging your animation in its current format. As I said before was a risky choice and seems was not clear enough for the audience, but I thought that the puppeteer would be more entertaining for me, selfish choice. 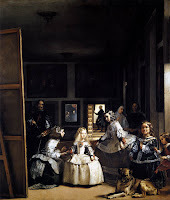 In your eCritique, Keith Sintay discussed opens to help solve this staging issue. With hindsight, would you have staged your animation differently? Mmmm, to be honest probably not. Although it make me realize what were my mistakes. One of these mistakes (I have to say that almost I knew that I was doing it wrong, but I went with it), was the last beat with the puppet wolf. Originally the attention had to be on the puppeteer, so the wolf had to remain in the back silent. However, the temptation overloaded me and I moved him forward and that mislead almost everything. About the staging and the position of the character in the screen, I wanted to create a contrast between him moving from side to side agains the last beat of him in the centre. This way, the shot gets more strength and balance at the end. I think Keith is right when he talks about the thirds rule. It is important to keep it in mind, but the rules and more in cinematography depend not only of the shot itself, but of the ones around and what you want to tell. The third rule gives you a safe grid to place the characters, but sometimes it is nice to push them and break the rules. It may work or it may not, but is nice to try and experiment. That is what is nice about these exercises, that you are able to try things and learn. And that is the magic in it. Is there anything you'd like to add about your thought-process or experience in July's competition? I always wanted to participate, but for me, there was different factors that were in play. Mainly the time. I work in the animation industry and sometimes finding a couple of weeks free is difficult. Once your schedule is free, you must also find the right story to tell with the dialogue. Finding the one that suddenly “lights up the bulb over your head” is challenging. After all, if you have to work on your free time or after a whole day of paid work, you want something that inspire you. And in July the odds were smiling, so I decided to go for it. And I have to say that I had a lot of fun doing it, and the consideration of the members was a great and I’m really very thankful. What advice would you offer to a beginner who wants to enter the competition? We all want to show something nice, but most of it entertaining, so I’ll suggest before sharpening the pencil or turning on the computer, spend some time, maybe just the first week, listening the audio and thinking on the story and the way to make it entertaining, maybe making some rough thumbnails, after that, once you got it, you are almost half way in. And of course have fun. Victor Navone has recently uploaded a variety of treats to his Vimeo account. Victor presents his portfolio work on Pixar's feature releases that include Toy Story 3, Cars, The Incredibles and WALL-E. You may also find a link to the thumbnails used to create his shots, plus Victor's tests for the studio, all the way back in the year 2000! Most of the questions I get about stop motion have to do with getting started, so here is a tutorial that will hopefully get everyone shooting. This one covers the basic tools, like lights, camera and software and gets into the first principle of animation to master--timing. Where do you buy this stuff? Electronics from Amazon (I like their return policy), art supplies from Michael's (craft store), costumes from Toys r Us, and lights from eBay. You can get armature wire from an art store or Amazon. Van Aken. Craft or art supply store. Does the clay get on your hands? Very much so. Especially the darker colors like blue and black. I animate with a package of wipes near by. Character animation takes about an hour a second. Walking and multiple characters takes longer. Where do you get your armatures? I managed to get a couple from a studio I worked for. I have also bought some from the Stop Motion Store, and made them out of wire. Are you going to make any more tutorials? This is probably it for 2012. I'm putting in overtime on Dead Space 3, and I have an animated Christmas video in the works. But I have it in mind to do one on animating a walk and building sets. 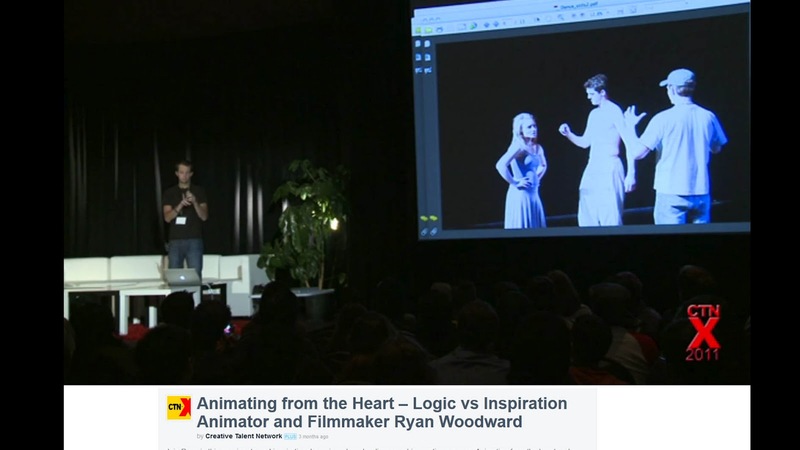 Ryan Woodwood talks about a topic that should be close to the thoughts of every artist: striking the balance between logic and animating from the heart. He discusses his anxieties behind it's creations, the story of why he chose to use particular dancers, the knock backs and his fears afterwards. Beautiful story! Thank your Ryan. After a few months off, I am pleased to bring you our next interview with one of 11 Second Club's monthly winners. Let the show begin, with kind words from Christian Larocque regarding his 17 year career in the industry. I wish to thank Christian for his time and really hope all you enjoy. You have spent 17 years in TV animation. What inspired you to pursue animation as a choice of career? I never get tire of it, it's truly the perfect art form to me. Animation it's so much more than moving drawings. It's sculpting, lighting, art direction, technologies, music, painting, the list goes on and on you can NEVER get bore with animation. As to make a career out of it, how can you say no to all of this?! Do you have a favourite animated television character? If so, who is it and why? Family Guy! I know, I know.. But that's the only animated show that I can watch and still found funny. It's also the only show where I can turn my brain off and not be thinking about animation. Every other shows I always found myself looking at the animation and see how they done it. But as a kid, I loved watching the old Bugs Bunny and Mickey Mouse shorts. Today I still like them but still find myself studying them more then enjoying them. Please tell us a bit about your footstep into the industry. I went to Algonquin College in Canada to study animation for 2 years. During my first summer break I got my first animation job at Lacewood Studio as a Poser. I was on a show called "The Savage Dragon". Later that summer I moved on to another show called "Katie and Orbie". By the end of the summer I actually saw one of my scenes Ink and Painted on a cells (the old fashioned way). That was the coolest thing I ever seen. That was the only time I ever seen that. After that everything went digital, an era had ended. Can you talk a bit about you feel your work has adapted to meet the changing demands of the industry. To answer this question, I need to talk about my last 10 years in the industry. Being in this industry it's all about adapting to the demands and change. This is how I did it. Back in the early 2000's. Hand drawn animation was dying and 3D was rising. To stay in the business you had to convert yourself to an Flash animator or a 3D animator. I decided to go explore the uncharted territories of "Flash". Back then and still today, a Flash animator was considered to be the lowest form of animator by our peers right beside paper cut out or sand animation. Feature studios would not even dare to look at your reel if your dared to mention the word "Flash!". So I gave myself a challenge. I wanted see if it was possible to create a TV show using the computer and make it look like it was hand drawn. I needed to rethink how to approach "Flash/CG" animation. I knew the way studios were doing it would not cut it for me. The most successful shows using Flash were done in a UPA style (very cartoony). They were very flat looking, with no perspective and snappy animation. I wanted the opposite I wanted the classical look. The Disney look. So I started to experimenting using several softwares like 3D Studio Max and Toonboom Concerto and Flash . I wanted to see what each software had to offer. At the end I ended up using Toonboom Concerto. It ended to be very complex and very taxing on the computer. Just moving 1 keyframe in the timeline would take up to 30 seconds to 1 min. But I discovered something new. I was able to make a character look traditionally hand drawn using the computer. The technique was a perfect mix of 3D and 2D and Flash. - Using the 3D mentality, you could move rotate stuff much like in 3D software. You could even animate with curves. - Using the 2D hand drawn mentality, you could have that nice drawing design and drawing cheats that only hand drawn can create. - Using Flash Flash mentality, you use very little amounts of drawings. This is the first test I did. It was a Smash it! 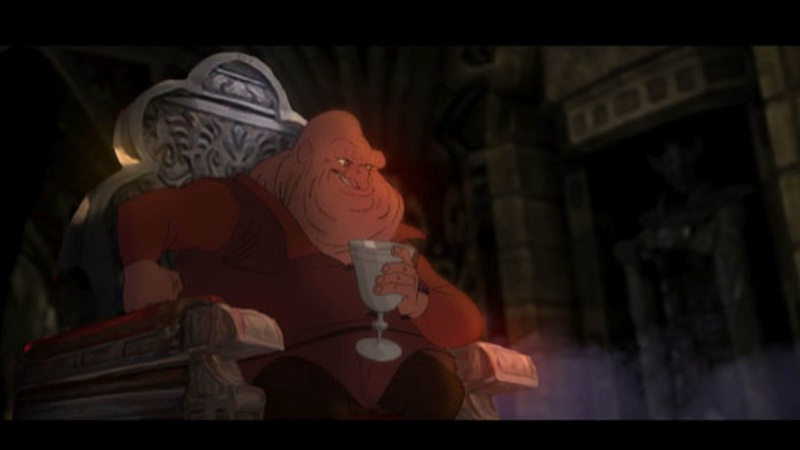 Nothing ground breaking animation wise but it proved, for me, that a traditional look could be achieved using a computer and we were no longer constrained to the UPA style. I always remember showing co-workers how I done it and they all look at me with that same look of "are you insane!" Then, one years later I got the chance to direct my first TV show and to put my new discovery to the test. The show was "Toot and Puddle" based on the books by Holly Hobbie. The first thing I animated was a promotional clip. Animating the show became a real challenge and a real learning curve. I had 30 animators that had to be trained in this new way and most of them right out of school. The first 11 min episode must have taken us over 2 or 3 months to animate. I had to get my crew down to 3 DAYS ! The show ended up looking great! As the days went by we became more comfortable with builts at started to make up time. Other artists started to pitch their ideas on how to make it better. It was very exciting time, we all knew that we were working on something very special, something that never been done. I guess the only weird down side of it, everybody in the world thought it was done drawn so the show never got noticed for it. 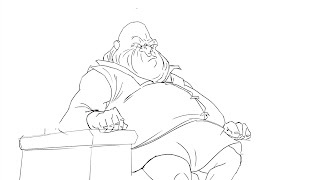 One animator ended up showing some scenes to Eric Goldberg. He never believe him it was NOT hand drawn. 3 years later I was Nominated for a Emmy for directing Toot and Puddle ironically I was going against a other show I helped to direct, Disney's Kick Buttowski. We both lost. Toot and Puddle ended up winning an Emmy for Best Background location that year. I couldn't be prouder of my crew! After Kick Buttowski, I was the Director (Canada) of Jake and the Neverland Pirates. Disney was interested to use the same technique I came up with to animated on Jake's. We learn allot from or mistakes on T&P and came up with new ways to simplify it and improve the technique. Today a crew of 25 animators can do a show in 4 days, 3 days if we push it. So next time you watch Jake and the Neverland Pirates keep in mind that the show was animated in 4 days and the show is not hand drawn. Do you have any ambitions to animate for feature film? For sure. 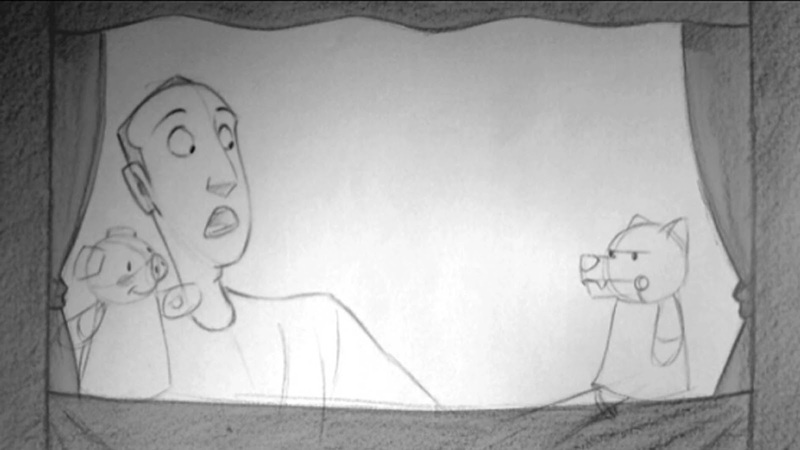 One of my life goals is to animate or, even better, direct a feature film. In recent years, we have seen an increase in online schools and resources. Please talk a bit about how you feel this has changed the landscape of animation. I believe online schools are the BEST! 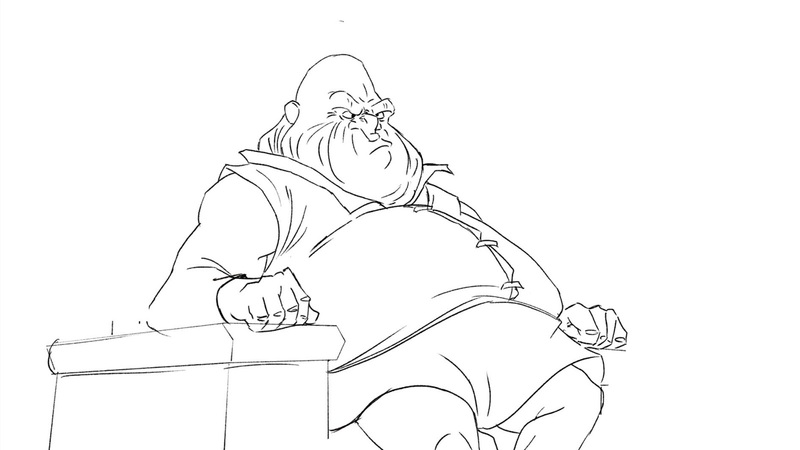 When I hire somebody that comes out from Animation Mentor it actually speaks more than a College diploma. 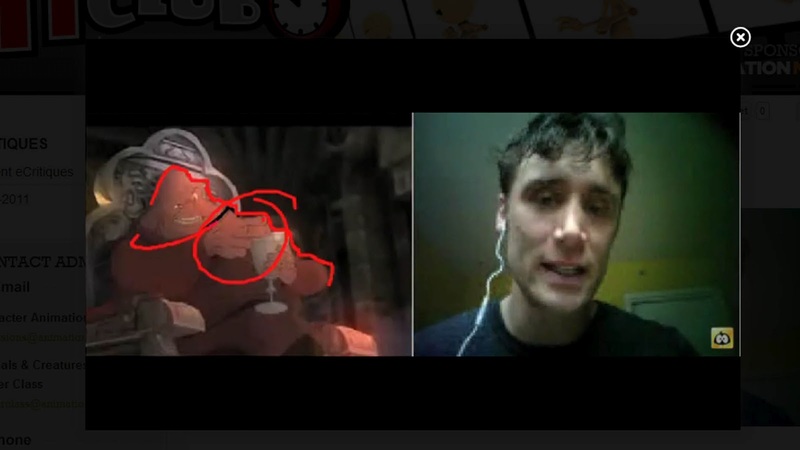 Actually an animator winning 1'st place on the 11 Seconds Club speaks for a lot also. So far I have worked with two 11 second Winners. Trent Correy worked on Toot and Puddle and he also worked on Jake and the Pirates with Matt Sheperd. The online information that is now available is AMAZING!! Every day I can check out some blogs and learn something new. It's like going to school every day. Thinking about it I have learned more about advance animation online, than I did at school. 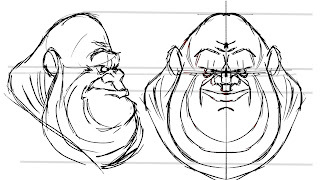 You recently attended an animation class taught by Disney legend Andreas Déjà. Please talk a bit about your reasons for taking the class. Well I was lucky enough to have my studio pay for the class it was only 1 day. I was really hopping to learn new tricks on animation. It turned out I didn't learn that much new stuff. The class was more on his years at Disney and the characters he animated. He also had a lot of fun stories about the 9 old men. But! Hearing him talk and seeing him draw, really gets you inspire. After the class all that you want to do is to go home and start animating! Which I did. You mentioned that through talking with Andreas, you realised you had not yet animated a sincere scene. Please tell us what you believe determines whether a scene is sincere? Well I come from a TV animation background, we need to pump out a amazing amount of footage every day so we relies on animation tricks and formulas. So I never had the chance to animated a character that seems to be thinking and even better that have a background story. I think that what's really makes a scene believable ...Thinking! Do you believe this will change the way you approach your work in the future. Oh yes!!!! 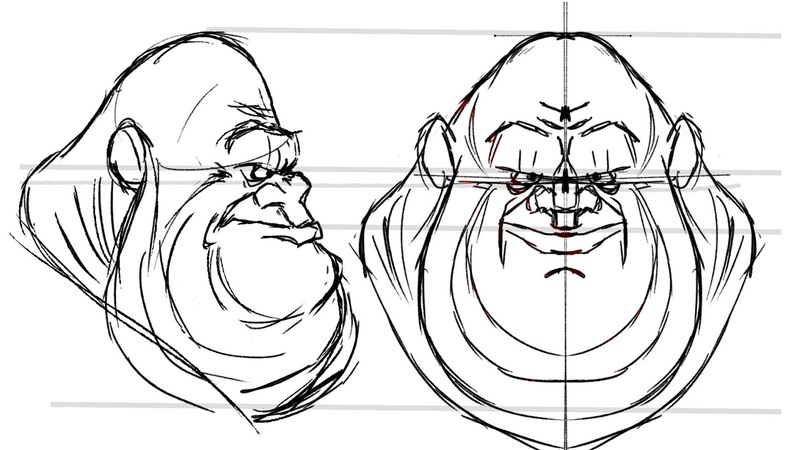 Before I just animated a scene to make them move in a very technical way ( I know the Richard Williams book by heart). Now I love animating a scene and coming up with a back story on the character it's so much more interesting to me. Please talk a bit about your production process. Well the first thing I did was a schedule. On this case I had 1 month. Thinking of the acting coming up with as many variation of it. I force myself to find 3 different takes on the same idea and then I took the best of all 3 and made it 1. The same Week I started to draw some design. Same here I force myself to do at less 3 designs and I pick the one I like the most. I took me about 1 week to create this built in Tooboom Harmony, it's much like a 3D built would work. You need to model it, rig it and test it. This is allot of work for a small scene like this. Usually a built that complex would be more useful for a TV production. This was always the fun part for me. I roughly animated 50 to 70 frames per day (5h per day). Basically the day before I thought about that little sequence and then the next day I animate it and so on and so on for 1 week. I also comp the scene at the same time I was animating it. So every night I got to see my scene finish and comp which was really fun. By that point my scene was pretty much done. I gave myself a few days to sit on it and to look at it with a fresh eye. I Spend about 2 days smoothing thing out..and BINGO was done!! 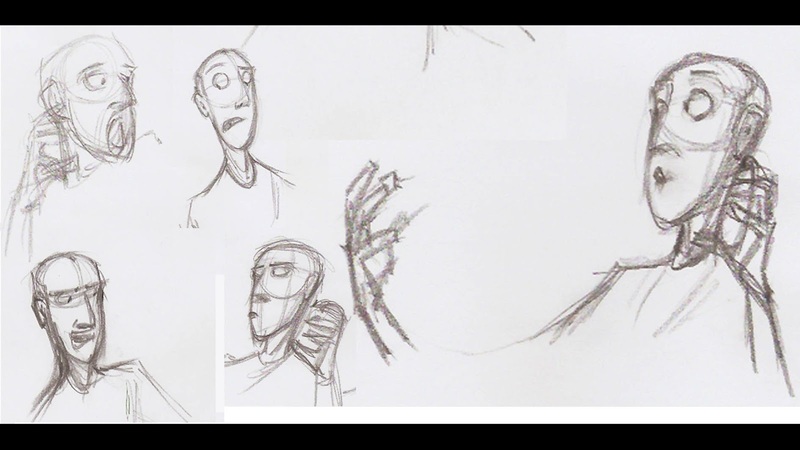 Do you use model sheets and turn-around to help you plan your animation? Here is the drawing I did by the end of the first week. I was having a very hard time to figure out the body, not as much the pose put more the clothing. I didn't want anything to complicated to animate. 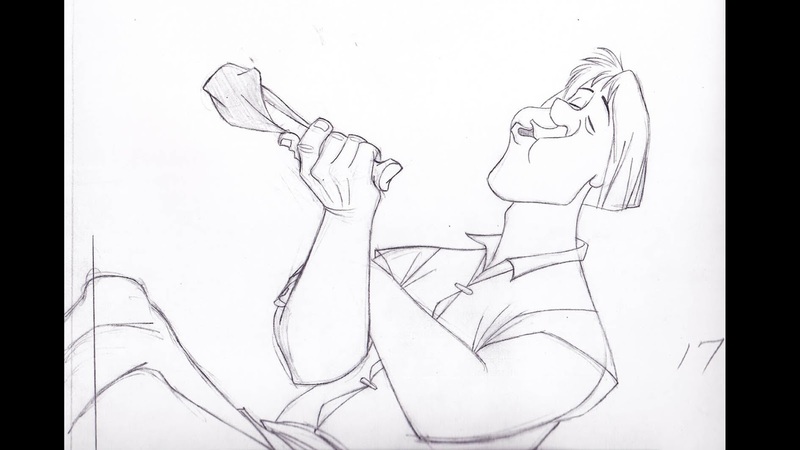 I was always a big fan of Milt Kahl and the Sword in the Stone... So I " borrowed " the clothing from it. I also did a very quick turnaround for the head to help me with the modeling. How has the programme Harmony assisted in the shot's production? The entire shot was done in Harmony, again using an advance Built. Very little drawing was needed, roughly 5 drawings total, maybe even less. Please talk a bit about creating the back-story for your character. Here is the story I came up with. Lord Hatter, is about to send 2 prisoners to fight to their death. The idea was, 10 years ago the roles where reversed. Lord Hatter was one of the prisoners and had to fight a man to death , but in that case it was his own brother. As a child his brother was always the favourite. So he became very jealous and started to hate him. And through the course of events, they both got captured and was force to kill his brother in the same event. I never came up with a story on how he became "Lord", but that's what is in his mind. He is thinking of his brother 10 years ago that he was forced to kill. Here is the transcript and under it I have type in want he's thinking. Finally lets the fun begin! I done this myself your little brats! Your both going to take it like a man. Like I did! You know what? I actually enjoy killing him. A bit dark but not too complicated. That's was roughly what I had this guy thinking. It is actually very rare for a winning entry to have a character remain seated throughout the scene, particularly without a camera cut. Please tell us about the challenge to keep this character alive. I didn't wanted to over-animated him. I didn't want to show off a bunch of movements just to make it look cool. I kept thinking about this one scene animated by Kristof Serrand for the Prince of Egypt. That scene really blew me away! No big movements allot of held pose, but man do you ever see him think so ALIVE! For my scene I try to do the same. I tried to make him think as much as I could. I also tried to lead the audience eyes. Leading the audience eyes is probably an animator best friend. It will save you lot's of work when you know how to do it properly. Talk about how the eCritique enhanced or expanded on the ideas you had originally set out to animate. I've been directing or supervising for the past 10 years. I'm usually the guy giving the critic. I never got an feature film animator to critic my animation before so I was really nervous to hear what he had to says. It turns out that he seem to like it. He talked about my lip sync a lot and how it was a tad off. That's always been my weakness. I really need to work harder on that. I always use the same excuse when I talk about my weak lip sync. As a kid and still today I see most of my movie translated in French ( My wife have a hard time following it in English) so the lip sync never match . So I guess subconsciously I learn to not pay by much attention to it. But again that's just a poor excuse and I really need to work on it. Funny enough I knew in advance about the bad silhouette hand pose at frame 89 . I really tried to stay away from the body but could find a good pose, it always ended up looking to forced to me. One solution that I didn't though that he mention was to change my acting ideas. At the time I was sold on the pointing and never thought of going on a different direction. That's the biggest down side of working alone we don't get feedback until it's done. After taking part the 11 Second Club competition, what advice would you share with your fellow traditional entrants? I don't really consider my entry traditional. It may have the look of hand drawn, but that's about it. 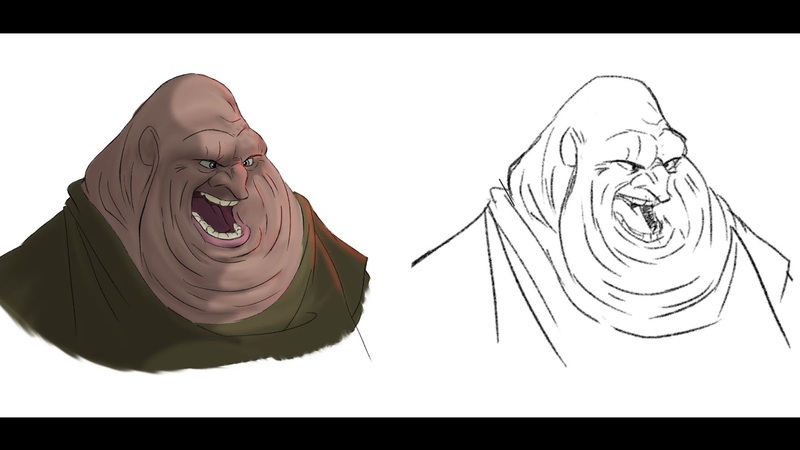 To make a living in animation you need to adapt to the demand and to the technologies. We must not forget there is Art and then there is Commercial Art. Most of us work in Commercial Art. If you want to animated on paper or even on a Cintiq to see how it was done back in the Golden ages of 2d animation, Do it! But don't bring your hopes up thinking to make a living out of it. When somebody asks me 'Do you think 2D animation is dead?!'. I always respond the same thing. I think the art of drawing frame per frame will come to a end soon. Just like inking and painting on celluloid did. But the look and the elegance of 2D animation will live forever!